We’ve said it before and we’ll say it again – taking care of your boat properly during the winter months is worth the time and effort you put into doing so to prevent costly repairs. Here are a few more tips on how to do so the right way. While a great many people think that putting their double A batteries in the freezer preserves battery life, it doesn’t, contrary to popular belief. In fact, cold weather zaps a battery’s power much faster than hot weather. This is especially true of car and boat batteries. That’s why one of the most important things you can do to keep your boat running smoothly when the warm weather comes back is to keep your battery on a trickle charge. This will help ensure that your battery doesn’t drain, but also keeps it from freezing too. A battery that froze over the cold months is more likely to need replacing than one left to trickle charge during the winter. You can make this easier on your conscious by using a solar charger. Another issue during the winter months is the engine or any other boat area that takes on water, and that includes any freshwater that’s been trapped in holding tanks. Freshwater freezes at below 32 degrees F, which is equal to 0 Celsius. Because the water will expand by almost 10 percent, bursting pipes is one of the most common problems with freezing water, and it is seen a lot in very small areas as well. You’ll need to make sure you’ve taken care of any part of your boat that has or even might have freshwater in it to prevent bursting pipes and cracking tanks. Drain the engine without forgetting the exhaust manifolds, or the any of the tanks. Additionally, remember to plug the drains when you’re finished. if you have a closed injection system for your fuel, ensure that you’ve protected it by adding an antifreeze made especially for it before the first frost. You’ll also want to ensure that you’ve used one specifically for your boat’s engine and that you’ve added it according to the manufacturer’s directions. If you don’t add antifreeze, ensure you’ve completely drained all liquids from the engine to prevent cracking and bursting. 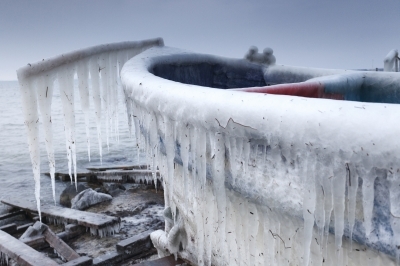 Something that boaters don’t often think about is the fact that seawater can also freeze, but it does so at a much lower temperature than freshwater, which is why it is so easy to forget about the fact that it does. Seawater freezes at 28 degrees F and below, or -4 Celsius. If you boat on the ocean, then you’ll want to ensure everything is drained and wiped clean – especially when dealing with salt water. Because salt can damage the paint, you should spray down your boat with freshwater to prevent rust and paint wearing, and then when you’re finished, ensure it is dry or the water you used to spray it down with could freeze.